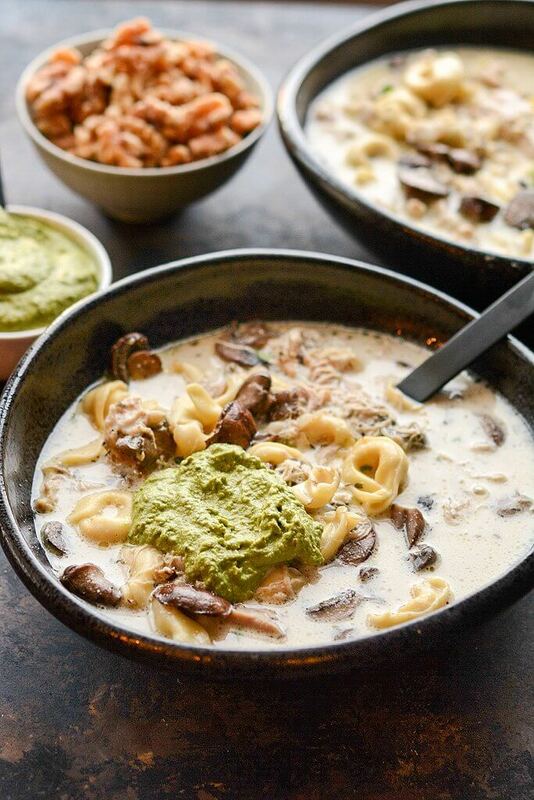 With fresh mushrooms and cheesy pasta, you just can’t beat this Slow Cooker Chicken Tortellini Soup! Soup in the slow cooker may sound like a typical and boring dinner but I’ve made it my mission to prove that doesn’t have to be true at all. 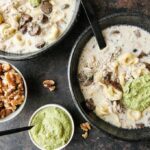 I’ve been known to make and eat soup year round, but I must say when the weather starts to turn a little cooler and we start to have some of that crisp fall weather, my cravings for delicious soups get a little out of control. From chili to chowder and broth based to creamy, there is no shortage of delicious options and ideas for creating a warm, comforting and easy meal. 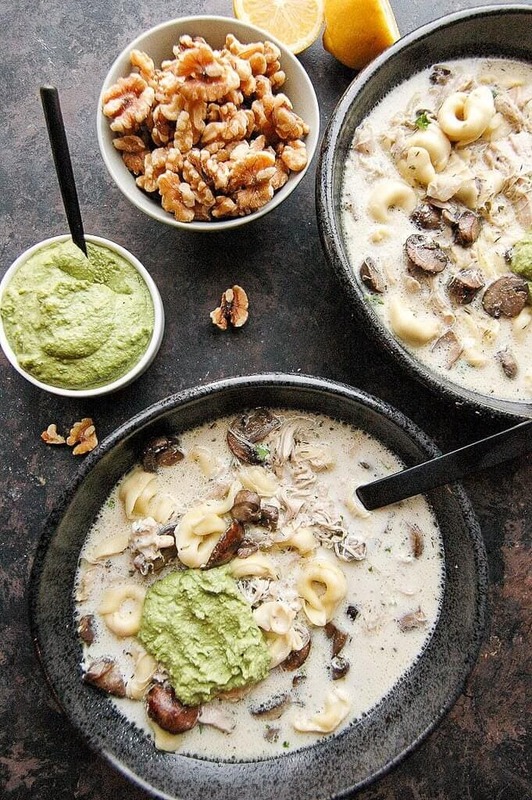 And this chicken tortellini soup with mushrooms and walnut pesto goes a long way to proving the theory that soup never has to mean boring. When having it as a main course, you certainly want a soup that will be hearty and filling. This recipe has that plus more. Boneless skinless chicken thighs give it so much tender and juicy flavor. Then we add in plenty of hearty baby portobello mushrooms that hold up perfectly in the slow cooker. 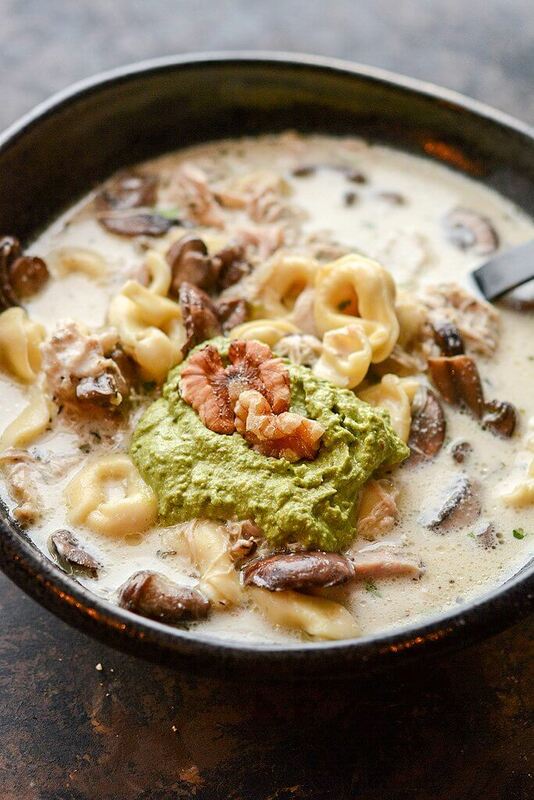 And let’s not forget the cheese filled tortellini, of course. But the thing that really makes this soup stand out? 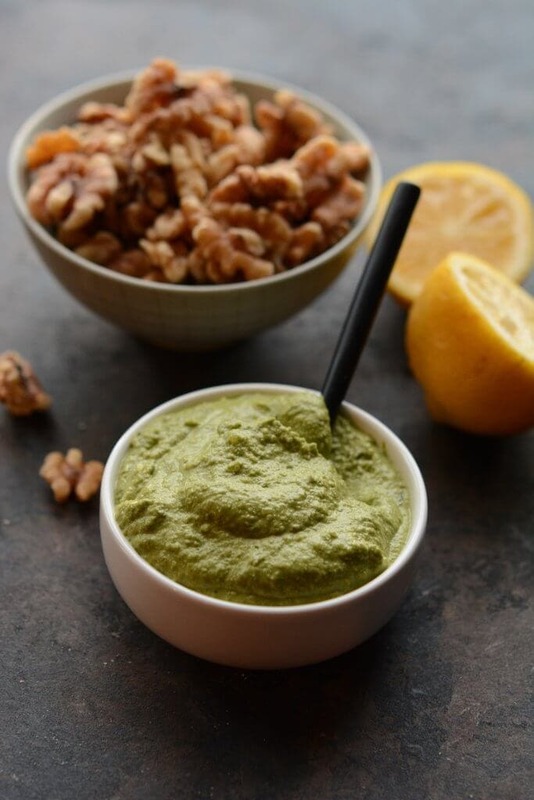 The packed-full-of-amazing-flavor walnut pesto! Every bowl gets a dollop of this amazing topping which really makes it a shining star. I rarely shy away from a cooking challenge, and when the opportunity to make a simple dish using California Walnuts came along, I knew I wanted it to be a dinner dish rather than a dessert. Walnuts are not a typical ingredient most people would use in a meal, but really they are so versatile and delicious and they add so much flavor, crunch and depth to not only sweet but also savory dishes that they make the perfect addition to so many recipes. In this case I used the walnuts to create a simple spinach pesto. This is not your typical pesto! 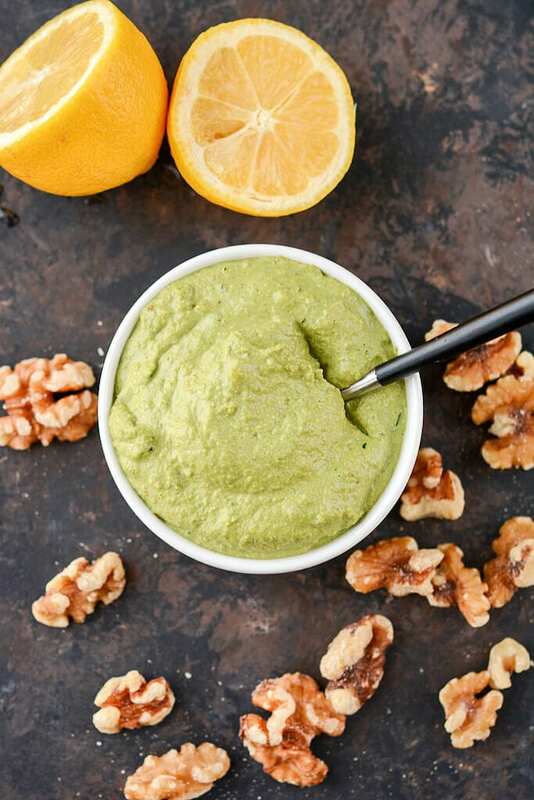 By using spinach and walnuts we add a new twist on the typical pesto you may be used to plus the flavors are the perfect addition to the soup. I am totally hooked now and will not only be making it for this soup but many other meals as well! A simple meal perfect not only for a delicious weeknight dinner, but also something you could be proud to serve at your next dinner party. 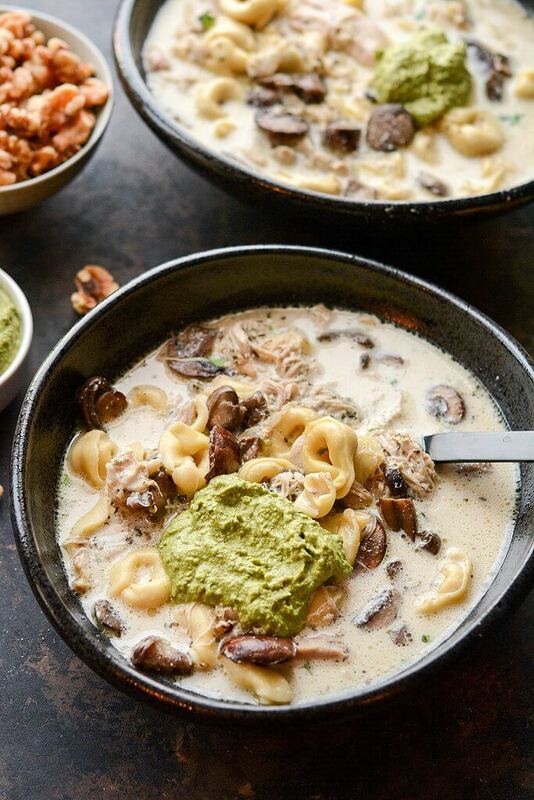 With fresh mushrooms and cheesy pasta, you just can't beat this Slow Cooker Chicken Tortellini Soup!